I would like to announce that Cupid Blogger Dot Com is finally on Twitter. Cupid Blogger Dot Com team has decided to join Twitter so that all followers will be able to get the latest updates on blog post, promotions and reviews. For newbies, Twitter is a free social networking services that provides real-time short messaging services over multiple networks. In short, it is just like Facebook, Friendster or Myspace. The best feature I like about Twitter is the question – “What are you doing?” which allows users to type not more than 140 characters and the updates can be sent across via mobile or web. For those who does not have Twitter, join Twitter now. 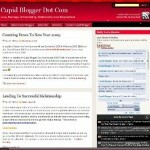 If you are using Twitter, don’t forget to follow Cupid Blogger Dot Com on Twitter by clicking on the Twitter icon below. PS: I would like to thank Ben Pei from Pei Profit Dot Com for encouraging me to sign up Twitter although I have been procrastinating (to be frank) on the potential of Twitter and its benefit for quite some time. Do stay tuned for more hot topics about love and relationship this week. tipsgoda’s last blog post..Using ‘MAGIC SPELLS’ To Make A Girl Falls For You?